Romitaman Original Comic Book Art :: Private Collection :: Mary Jane Drawing (1988) SOLD SOLD SOLD! by artist John Romita Sr. This 1988 convention drawing of Mary Jane Watson is the work of the great John Romita Sr and a neat example of the artist's work on arguably his most famous character he was first to draw. Drawing was first created with blue pencils, then thin ink pen for contouring, and thick permanent marker used for MJ's classic hair! Taking over drawing chores for Spidey's co-creator Steve Ditko, John Romita began work on Amazing Spider-Man with issue #39. His clean, robust style was perfect for a slightly more mature Peter Parker and the new look he brought to Spider-Man would endure into the 1980's. It was during John Romita’s run on the series that Spider-Man would skyrocket in popularity and Romita’s hand would be pivotal in developing the Marvel style that dominated the comic book industry throughout the 1970's. In the minds of many collectors, Romita’s input is on par with Ditko’s in defining the look and feel of Spider-Man and solidifying the web slinger as one of the most popular super heroes of all-time. 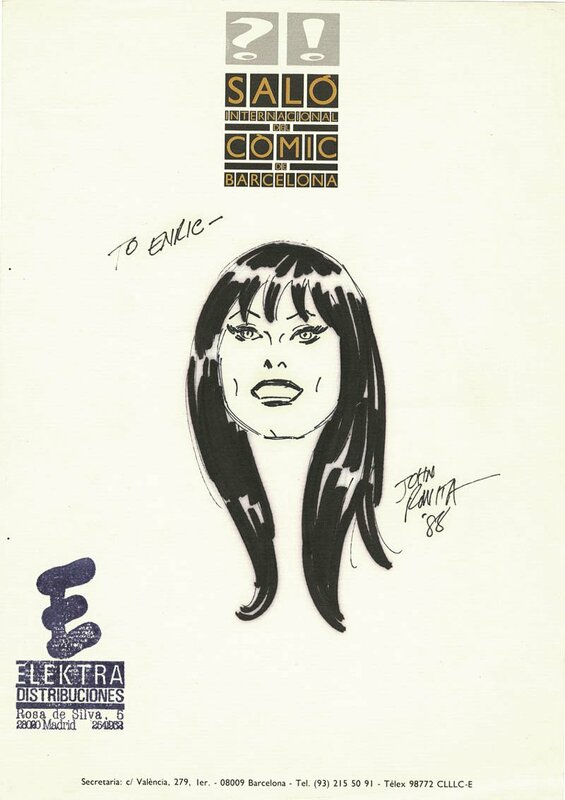 The art was drawn at a comic book convention John Romita attended in Madrid Spain in 1988. Art was drawn on 8.25 by 11.75 inch art paper and MJ is a nice 6 inches long.